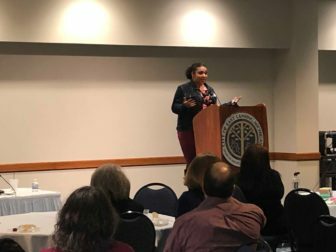 The City of East Lansing, East Lansing Human Relations Commission, Michigan State College of Education, and Dr. Martin Luther King Jr. Commission of Mid-Michigan put on a community conversation about bans, walls, and mass shootings in our society. The talk took place at the East Lansing Hannah Community Center on March 27. “We want to create a place where people feel courageous,” said Hannah Community Center coordinator Elaine Hardy. East Lansing’s Human Relations Commission put together a panel of five experts on gun violence, racism and race relations in the United States. The panel featured three professors, psychiatrist, and a high school student. Amira Rinker Okemos High School Senior talks at Face to Face event. The discussion was led off by Okemos High School senior Amira Rinker, who recited a speech she wrote after the Parkland school shooting called Russian Roulette, where she spoke about the fear attached to being a high school student. The crowd gave Rinker a standing ovation. The other speakers told their own stories. Each was moving and hard to hear. Mohammad Hassan Khalil tells story at Face to Face event. The panel asked the East Lansing community to stand up for what’s right. 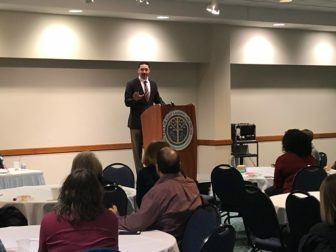 This event was a part of a series of East Lansing events planned effort to spark community conversations about diversity and inclusion. The room was filled with people from all backgrounds talking about their own story. City Councilman Aaron Stephens attended. //It says on the agenda that he is the City Council liaison to the commission. I'm Ryan Collins, a sophomore journalism student with a minor in sports journalism who inspires to become a prominent sports radio host or any stable job in sports. I currently co-host two different podcast(Motown Rundown and Behind the Mask) and cover the MSU Hockey team for WDBM Impact radio.